Combine coriander and mustard seed; coarsely grind in a spice grinder. If grinder is not available, place in a heavy-duty zipper-locking bag and place on a cutting board. Using a meat mallet or rolling pin, crack seeds until all have been coarsely broken. Combine ground spices with all remaining ingredients. 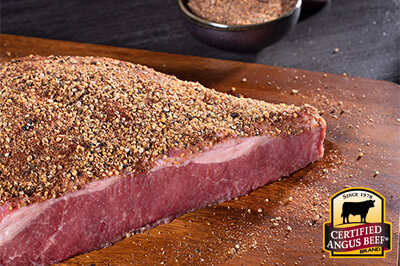 Remove Certified Angus Beef ® corned beef brisket from brine and rinse; discard brine. Season evenly on all sides with pastrami rub before smoking.